Last Saturday saw the Willesden host the 400km round of our Audax Super Randonneur series. Chris Beynon did an exemplary job of organising the event and producing a very clear and accurate route sheet. The entry card was full and Chris was obliged to close off entries several weeks prior to the start. The popularity of this event meant that the reserve list grew longer with each day. In total 70 riders took part and among them were 14 Willesden members. The ride started in Chalfont St. Peter and went via controls at Woodstock, Tewesbury, Chepstow, with a final stop Membury Services on the M4. Along theway it takes in the legend/leg-end that is Yat Rock (20% average gradient). The time limit for the event is 27 hours, however Mel Kirkland must have spotted something good on the telly as he arrived back first, despite being over 30 minutes late at the start. 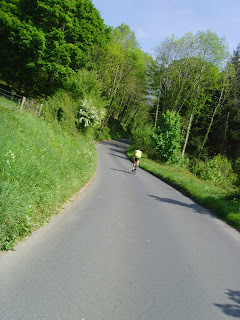 Mel covered 250 mile course with 3,800 metres of climbing in around 17 hours. 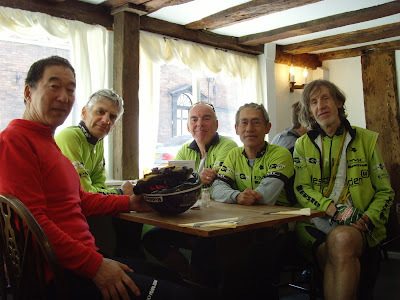 At the other end of the scale were the trio of Kelly, Brooking and Davies, who were combining the Audax with an in-depth survey of coffee and bun offerings from all the cafes and service stations along the route. They rolled in with about 10 minutes to spare, with the excess caffeine proving particularly helpful in covering a largish distance in the last minutes of the event. The Willesden Youth Development Squad (Jack and Karl) were last seen at Woodstock. It turned out that they had to pack due to mechanical reasons and took the train home instead. Grandfather’s Cafe, Tewsbury. The occupants suit the name! Pain? Suffering? When can I do one?